Honorary Degree of Doctor of Art in recognition of his significant contribution to the visual arts and the way art in public locations can challenge and inspire as a catalyst for social change. Since graduating from Nottingham Trent University in Fine Art in 1987, Wolfgang Buttress has become an artist of international standing. He has created works that are permanently installed in major cities around the world including Canberra, Tokyo and Belfast. Wolfgang’s large and impressive public sculptures have won numerous awards, recognised for their use of digital technology, scientific knowledge and application, high end contemporary and traditional materials and a craftsman-like approach. 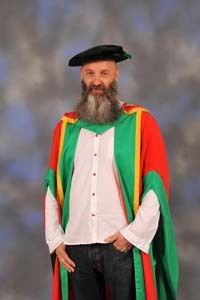 The first of his family to go to university, Wolfgang came to Nottingham from Cumbria in the early 80s. He recently worked with researchers from Nottingham Trent University’s Physics department to create the UK pavilion at the World Expo in Milan 2015. Searching for a simple metaphor for the state of the planet, he selected the bee due its fundamental role in the health of the global biosphere. Using NTU research on the vibrational signals of bees, he connected a real hive in Nottingham to a sculptural Hive in Milan. and one which is all the more necessary when embarking on a collaborative journey.